YouTube Uploader is a software to split and upload big video files (Like your Marriage CD and DVD files etc) of smaller duration size and then upload it to YouTube. For more details click here. Evaluation version of the software will run for 7 days. After the evaluation period, some of the functionality will get disabled. You need to Purchase ( Register ) the software to make it fully functional. Once you purchased the software we will send you the registration key which will make the software fully functional after the evaluation period. KTS YouTube Uploader is a simple and convenient piece of software tool which will aid the users to upload their favourate videos to youtube from the comfort of their Deskktop PC . If you split and upload videos to YouTube through the Web site at least once, you know how slow the process is and sometimes you might even get frustrated because of that. 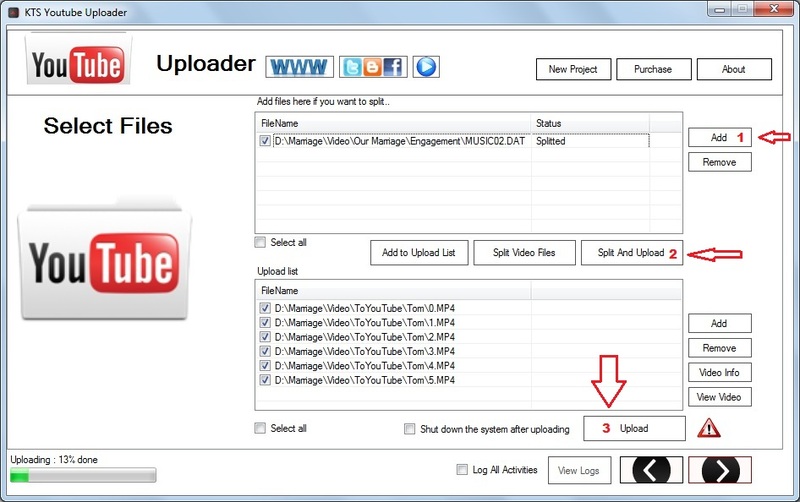 KTS YouTube Uploader ease your job by spliting your videos and uploading it to you tube from one screen and from the comfort of your desktop application.